Science considers breakfast as the most important meal of the day. You can try these best breakfast ideas that your kids will love. 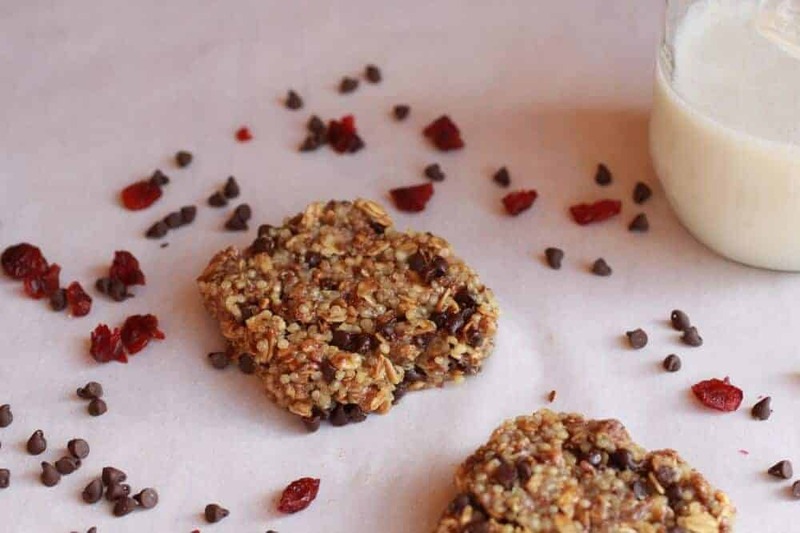 These breakfast ideas are perfect for school days or any of the day of the week. Popsicles for breakfast? It sounds very unusual right. You are going to be the coolest mom ever and why not? 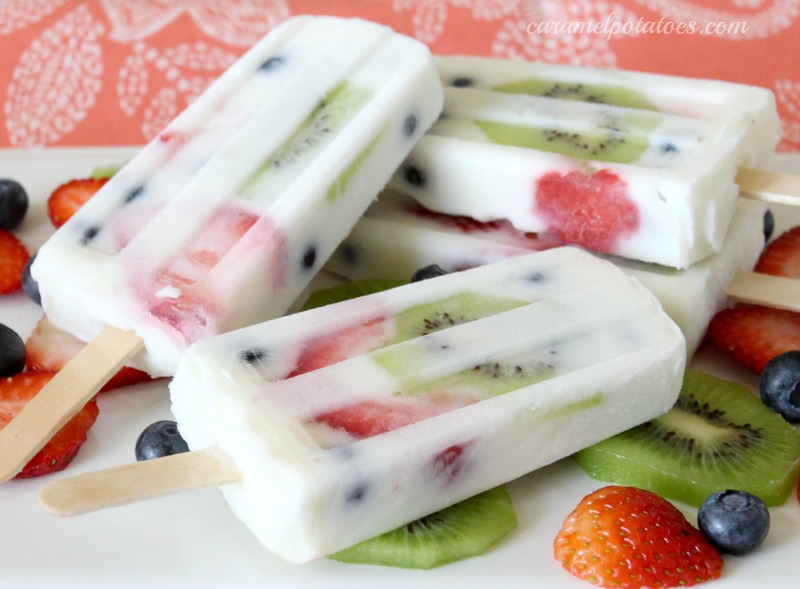 These frozen popsicles having yogurt and fruits- that’s it! You can eat popsicles any time of the day not necessary to eat for breakfast only. A delicious and healthy snack any time of the day. I simply fall in love with these popsicles, they are beautiful. The all fruit peeking out, it is irresistible feeling now. A non-fat vanilla yogurt is used in these popsicles but you could use any flavors of your choice. We had added blueberries, strawberries and kiwi. Other delicious choices are raspberries, peaches, mangos and pineapple. Simply you have to just freeze them in Popsicle molds for a morning treat. If you don’t have Popsicle mold, no reason for worry, a small paper cup with crafts stick will be sufficient in absence of mold. Add a little amount of yogurt to mold, slide fruit slices down the sides it looks very pretty after freezing. Add more amount of yogurt and more fruit until mold is completely filled. Put craft stick and freeze it. Unmold and serve it. These breakfast banana pops are very easy to make. It’s a delicious kid’s friendly recipe as well. This recipe is ideal alternative for people who hate to cook. 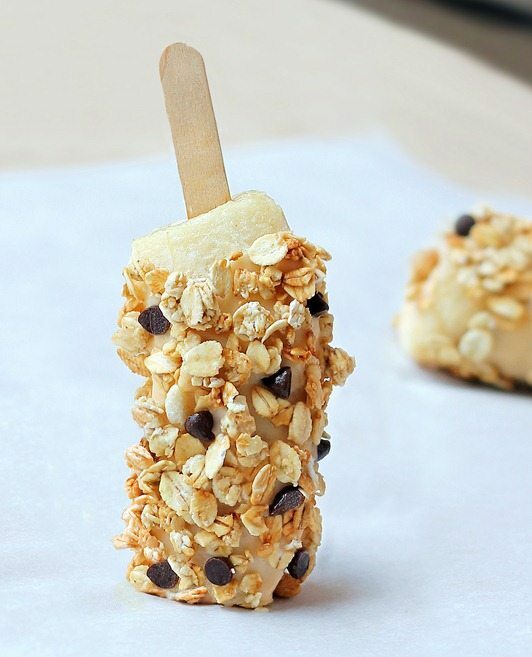 These banana pops could be great for breakfast or part of breakfast. It’s good balanced breakfast, especially very good cooling off after a hot morning workout. -You can add up mini chocolates chips, coconut shreds, cinnamon sugar, raisins etc. Take 2 Bananas that will make 4 pops. Pour granola into a very shallow dish or plate. Peel off the bananas and cut in half, and insert Popsicle sticks. Dip into yogurt (or you can coat with a knife), then roll into granola and other add-ons. Place on parchment or wax-lined tray and freeze. Keep these pops in the freezer. These thick slices of tomato give this healthy breakfast a hint of sweetness. Top each muffin half with tomato and set aside. In a small nonstick skillet, heat oil over medium- low. Gently crack eggs into skillet; cook until whites are almost set, 1 to 2 minutes. Top each egg with slice of cheese; cover skillet for 1 minute. Slide one egg onto each muffin; season with salt and pepper. These crunchy, sweet bars are rich in protein, fiber, antioxidants and omega-3 and omega-6 fatty acids. These are super easy and quick to make. These are too easy and quick to prepare. The tedious part is waiting for them to firm up overnight. I am simply impatience, so I just put the pan in the freezer for an hour and they were too good to eat. When storing the bars in a container, don’t forget to place a sheet of parchment paper between the layers which will prevent the bars sticking together. Line an 8*8 pan or baking dish along with parchment paper. After lining up, Leave some extra space on the sides to use as handles for removing the bars later. In a large bowl, mix the oats, flax seed meal, seeds and nuts. Add agave nectar to the mixture and stir it thoroughly until well coated. Scoop up the mixture into the prepared pan/baking dish and press firmly until it is evenly distributed. Original recipe instructs to allow mixture to then sit overnight (to firm up) before cutting into bars. I am impatient – I put mine in the freezer for an hour or so and it seemed to work just fine. Using the parchment paper handles, remove the entire block from pan/baking dish, then cut into bars as per size you desire. A decent breakfast packed with full of nutrition is French toast with Berries. When it comes to food, the French know how to prepare food right. They simply take awesome bread and make it really more awesome buy soaking it in eggs and cooking it in butter. Also add cottage cheese, berries and real maple syrup. When you think about French toast, it’s all about the bread. I had to use a thick and hearty flaxseed Ciabatta or a nice artisan bread for this recipe. It’s better to use a day old bread. Real maple syrup is tapped and obtain from trees. I always used vanilla paste instead of extract. Mix together egg, vanilla and almond milk and, set aside. Heat pan on medium heat till hot and add butter to the pan. When the pan is hot and butter is melted, dip bread in egg/almond milk mixture and set in pan. Cook for about three minutes, till golden brown and then turn and cook another side until golden. 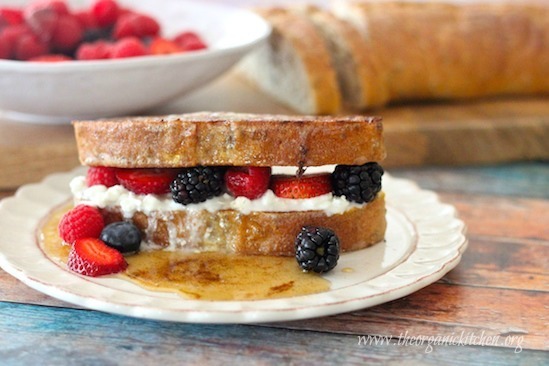 Spoon organic cottage cheese on one slice of French toast and top with berries. Then place the second slice of bread on top of that and Sprinkle with the syrup/vanilla paste mixture. Top up with a pat of butter, serve. Serve one of the finest combination of eggs and vegetables to your kids. Slice a paper as shown in the picture. Add in extra spices or herbs. You just need to select some of favourite fruits of yours, some plain Greek yogurt, and a topping of your choice and a glass jar to hold it all! A healthy breakfast that can be easily taken to your workplace is sometimes a challenge. So one of my prime work to do on Sunday afternoon is a batch of breakfast parfaits in jars. I am using mason jars and canning jars, and just fill them with layered fruit and yogurt. Then during following the week, we can just take a jar from the fridge, a small container of nuts or granola. Presto! A pre-made, convenient, and yet very healthy breakfast. This is an especially most appropriate option when summer fruits and berries are available in large quantity. But during the autumn and winter months, you can use dried or frozen fruits and barriers, which work perfectly as well. Our local market is normally having a large number of different types of fruits, this can help you to prepare a different parfait every day of the week. I make up several batches of granola on the weekend which will last the entire week. This is a good crunchy topping that has grains, nuts and seeds to add to the nutritional value of yogurt and fruits. In all, you have a complete meal that will keep you full for hours. All you need is a selection of your choice of favourite fruits, some plain Greek yogurt (Thicker), and your favourite topping. Layer the fruit and yogurt in the jars- we usually put fruit on the bottom and yogurt on top, but you can create as many as layers you would like in whatever order you want. Store them in the fridge and when ready to eat, just add your favourite crunchy topping and there you have it. It’s breakfast on the go that doesn’t feel like breakfast on the go. Breakfast burrito bites- Healthy kids always eat Healthy Breakfast. Some Mornings your kids just need something little but healthy breakfast. 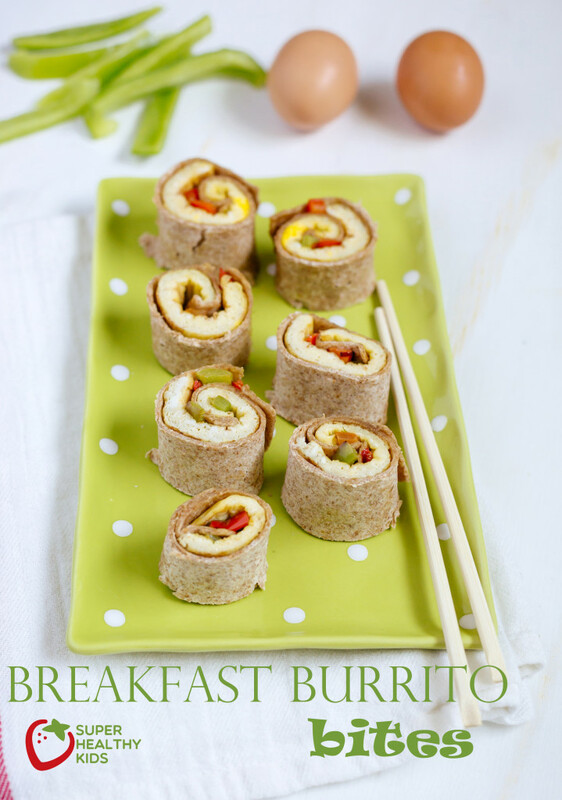 These mini breakfast burritos are most preferred breakfast for those kids who actually don’t like to eat breakfast, yet you want to get a little healthy food in their tummy. We had taken some peppers, cooked an egg, rolled it in a whole wheat tortilla, and cut ways like sushi. Chop bell paper and add to skillet. Cook for 1-2 minutes, then remove from pan. Whisk together eggs and water; add to the same skillet. Cook but do not scramble. This is how it looks? A peanut butter and banana sandwich. I really feels not bad at all. Actually, it tastes really mouthwatering. I had used almond butter instead of peanut butter simply just because I really like the taste of almond butter better. I wanted a simple, small, early snack that will power up my morning and my jogging and give enough nutrition for my muscles, bones and other tiny cells working 24/7 and 365 days. Whisk the egg whites and egg together. Scramble in a skillet coated with cooking spray and set aside. Place 1/3 of the mixture in each tortilla and overlay. Place in the freezer on a plate or baking sheet lined with parchment for one hour. Remove and wrap individually to store or place in a freezer safe bag. To reheat, take out the quesadilla and microwave until cheese is melted. To reheat in a skillet, first microwave it to defrost and then warm in a skillet to get the outside nice and crispy. Prepare the oatsthe night before. Take a large bowl and in that large bowl, mix together quinoa, granola, almonds, flaxseed and salt and stir to mix well. Fold in chocolate chips and/or pomegranate seeds. Stir in honey, coconut butter and vanilla extract, mixing well with a spoon until uniform mixture is formed. Place the mixture in the microwave for at least 45 seconds. Allow to cool slightly for a while and pour over the dry ingredients mix until entire mixture is moistened. If you feel that it still seems too dry, add additional honey 1 tablespoon at a time, but make sure you don’t want it to be too wet. Take a baking dish and Line a 9×9 in the baking dish with plastic wrap or parchment paper. Firmly press the mixture into the pan, into all the corners and evenly top it off with a spoon. You will need it packed as tightly as possible. Refrigerate for at least 2 hours, then remove and lift granola bars out of the pan, cutting into 12 squares. These work best when refrigerated. 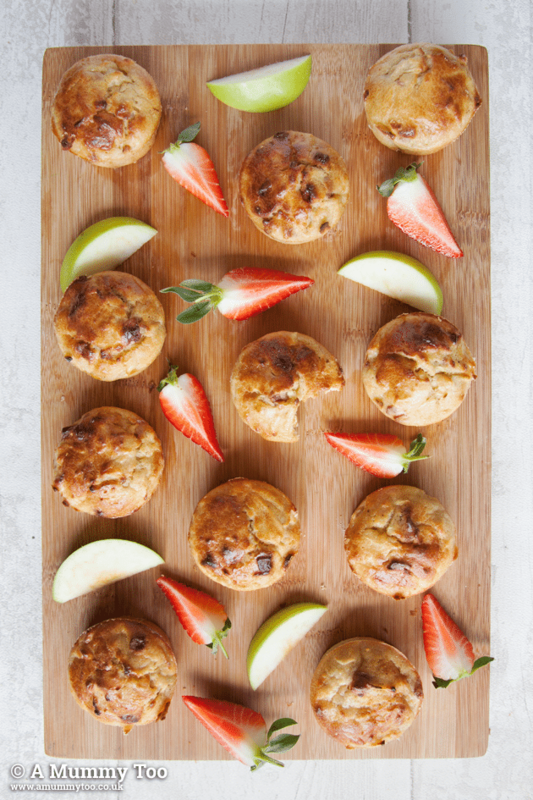 These no junk muffins have delicious taste, goodness and sweetness of apples with a taste maple syrup makes it a great kid’s friendly recipe. They are the healthy alternative to the average muffin. This is novel idea to reduce junk from kid’s food. Grind the apples and stir with the egg mixture with strawberry pieces. Spoon into greaseproof muffin tins,and bake for approximately 20 minutes, until golden and cooked in the Centre. A pie is one the most integral part of my life. My love pie and hence pie is very dear to me. It is the one food, I am crazy about pie. Serve all the flavour and yumminess of pie with the goodness of oatmeal! In a small saucepan, mix the blueberries, water, honey, vanilla extract, and a pinch of salt. Stir to mix thoroughly, then sprinkle with the cornstarch and mix evenly. Bring to a boil, then let simmer for 5minutes, or until thickened. A powerful breakfast that your kid can eat on the way to the bus. Take the whole wheat tortilla and spread peanut butter on it, put some bananas and add few dark chocolate chips. You can add berries or nuts to up the nutrition. Bake for 30 minutes or until browned and set. Run a dinner knife around the edges of the quiches, remove from the pan and serve with your favourite salsa, some extra sour cream, and cilantro. A delicious, easy and healthy option for special treat. 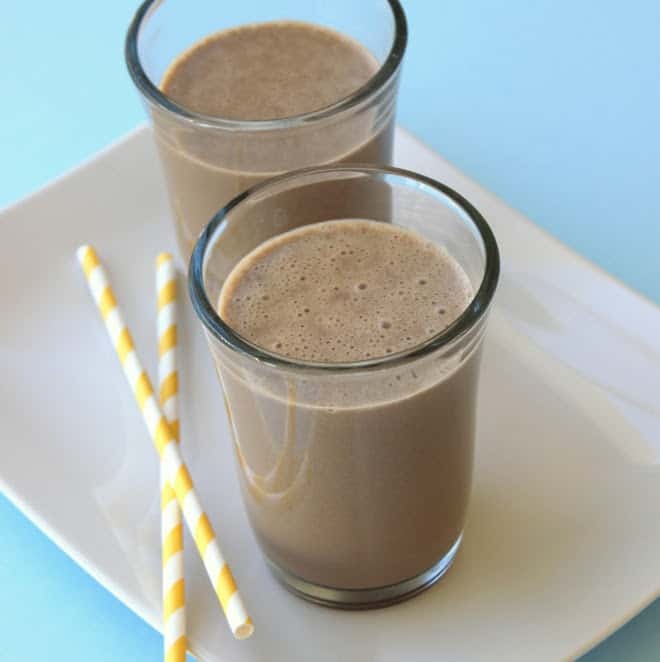 It is a treat but simply much healthier than a chocolate milkshake. I had used dark chocolate almond milk rather than dairy. This smoothie is great to serve to the children because it is like a treat for them and still having protein and fruits in it! It is made with Greek yogurt, ripe banana and whole wheat flour. They taste very healthy! In this beautiful world I am not one to sacrifice great taste for health food, so if you are looking for a great treat to keep your taste buds and your tummy happy…you have chosen the right place. Making these pancakes is actually too easy and simple. Just plain day to day useful ingredients like whole wheat flour, egg, mashed banana, milk and yogurt. I had used cinnamon as a flavouring agent and vanilla extract (and banana) and very lightly sweetened with brown sugar. There are some important tips about this pancake recipe that is very important for their texture and taste. Don’t think about to leave out the brown sugar; your pancakes will not taste good. They will taste like health food only and you will never think about it to make them again. There are only 2 tablespoons of brown sugar required for the entire 8 pancake recipe. You must use an extra ripe banana. You will require using 1 banana for a pancake. And maybe one more to serve on top. The brown banana having the sweeter taste which will make your pancake very sweet. You should take care that your pancake will not over mix. Over mixing of pancakes will turn them into dense, heavy pancakes. Make sure your pan is hot before placing pancake, I am simply placing drops of water on the preheated griddle, once drops starting evaporating immediately it is right time to place pancakes. Spray your pan between each pancake and batch of pancakes. You can use butter. Serve the pancakes plain with sliced bananas on top, or with pure maple syrup, jam, honey, strawberry Greek yogurt, apple butter, etc. These whole wheat pancakes nearly similar as fluffy as buttermilk pancakes. This is very healthy breakfast guys. Banana pancake is a very delicate recipe in nature. Any slight changes you will make in this recipe will result in a different pancake. I urge that kindly use this prescribed recipe or alternate that I had suggested. Mix the flour, salt, baking powder, and cinnamon together in a large bowl. Set aside. In the second medium bowl, whisk the egg, milk, and banana together. Whisk in the brown sugar and yogurt until no lumps remain. Whisk in the vanilla until combined. Make a well in the dry ingredients and pour the wet ingredients in. Stir gently until just mix. Make sure you should not over mix the batter otherwise your pancakes will become very tough and very dense. Add any mix-ins you prefer, but again- do not over mix the batter. Heat a pan over medium heat. Coat with either oil, butter or cooking spray. Once pan very hot place about ¼ cup of batter on the griddle. Cook until the edges look dry and bubble starting to begin on the center or sides, near about 1 minute. Flip the batter and cook on the other side until it cooked completely near about 2 minutes. Coat skillet once again with nonstick spray for each pancake or batch pancakes. Keep pancakes warm until all pancakes are cooked, suitably placing all pancakes in preheated 200F degree in the oven. Serve them immediately. Pancakes taste best when they are served immediately after they made. You can preserve pancakes up to 2 months when you freeze them well. A nutritious alternative is a muffin topped with apple and cheese rather than any other more sugary recipe. You can use a whole-wheat or oat-bran English muffin, or a whole-wheat bagel. The cut side of muffins place upside in a toaster or on a baking sheet under the boiler. Toast English muffins until it turns into lightly browned. The lightly browned muffins, Top each muffin half with half of the apple and half of the cheese. Broil until cheese is melted. A good way to start your day is a combination of peanut butter and apple on an English muffin. This combination is very popular one. Spread peanut butter or muffin halves which are divided evenly. Sprinkle the muffin halves with wheat germ; then top muffin halves with apple slices. Serve it open-faced. You can imagine your healthy breakfast options with Weet-Bix. You can try out the combination of strawberry, yoghurt and chia seeds. In a bowl, place Weet-Bix and add yoghurt, strawberries and chia seeds on top. If you require, pour milk or any other suitable milk alternative of your choice. You will surely like a bowl of French toast topped with ripe berries rather than a bowl of cereal. Heat butter in a baking dishes of an oven at 350° F.
In a large bowl, mix the milk, eggs, 1/3 cup sugar, vanilla, and salt. First remove the crusts from all the bread, then spread butter one side of each piece. Make the triangle by cutting each piece from half involving cross corners. Arrange some of the bread keeping buttered side up around baking dish. Now top with the berries, make sure to keep the bread around the edges of the dish. Now pour the custard mixture over the bread and berries (about 2/3 cup per dish). Sprinkle with the rounded tablespoon of sugar (About 1 teaspoon per dish) and now it is time to place bowls on a baking sheet. With the help of foil cover the dishes loosely and bake for 20 minutes. Uncover and continue baking until the custard is set and the bread turns into light golden brown, near about 30 to 35 minutes more. When cupcakes meet the breakfast! This easy to make waffle cakes recipe will have your kids at the breakfast table quickly. Firstly heat oven to 350° F. Line a 12-hole muffin pan with 8 paper liners. With the help of electric mixer beat the butter and sugar in a large bowl until it becomes light and fluffy approx. 3 minutes. Now lower the speed to medium and add the eggs, one at a time, beating each until incorporated before adding the nest. Beat in the vanilla. Lower mixer speed to low and add the flour mixture in three parts, you can also be alternating with the milk and beating just continue until incorporated. Reserve ¾ cup batter, then divide the remaining batter among the paper liners (about ¼ cup and 1 tablespoon each). Bake until a wooden pick inserted into the centre comes out clean, 18 to 20 minutes. Transfer to a wire rack and let sit until cool enough to handle. Make the waffle cakes: Heat a waffle iron and gently push a cupcake, top side down, into the batter. Repeat 3 more times, depending on how big your waffle iron is. Cook, uncovered until the batter becomes golden brown and it would no longer wet on the side facing up, 4 to 5 minutes. Finally, allow the waffle iron to come back to temperature, then repeat with remaining batter and cupcakes. Top with fresh berries and whipped cream, or Nutella, bananas, and peanuts. I hope now you don’t need to think about breakfast for your kids and kids also not say no to tasty food. I can also include your favorite recipes please share your recipe in comment. 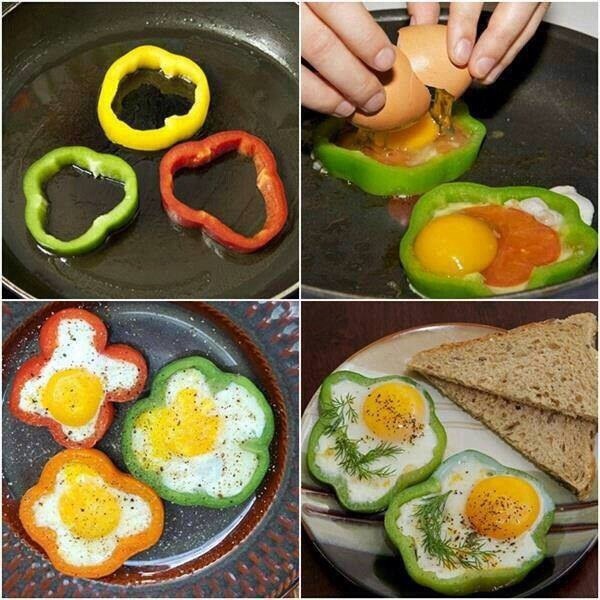 If you like these Breakfast ideas then share with your friends. Loved the great collection of breakfast recipes for kids. I will try and share with my friends..